CHAPEL HILL, N.C. -- For the first time since 2009, North Carolina completed a regular season sweep of Duke, knocking off the top-five ranked Blue Devils 79-70 on Senior Night in the Dean E. Smith Center. While the pregame hype surrounded Zion Williamson, Duke's offense catered to the efforts of RJ Barrett (26 points, 12 rebounds) and Cam Reddish (23 points), the most impactful and impressive freshman performance of the evening was North Carolina point guard Coby White. White led the Tar Heels with 21 points, hitting four three-pointers and pushing the pace. He went one-on-one with Duke's Tre Jones -- known as one of the better on-ball defenders in the country -- and won battles that sparked confidence in his game. White was talking, often, and bouncing around the floor with enthusiasm after made buckets to the delight of the crowd. Roy Williams has said that White is one of the fastest and most potent scoring point guards he's ever coached, making even-keeled comparisons to former ACC Player of the Year and national champion Ty Lawson. Ten years after sweeping the series against Duke, another speedy point guard has done it again. 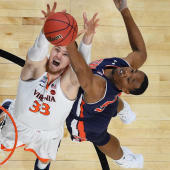 The win gives North Carolina a share of the ACC regular season championship with Virginia, who also clinched its spot at the top of the standings with a win against Louisville earlier on Saturday. It's the ninth regular season conference title for the Tar Heels since Roy Williams took over in the 2003-04 season and third in the last four years. For Duke, the loss was not only devastating from the perspective of taking two straight defeats in the sport's best rivalry, but also potentially costly for its postseason chances. In the first three minutes of the game, starting center Marques Bolden was helped off the floor and to the locker room with a knee injury suffered on a hard fall after attempting to block Garrison Brooks' dunk. With Bolden and Williamson not available, Mike Krzyzewski was left with just Javin DeLaurier and Jack White as options down low. With the freshman trio of RJ Barrett, Cam Reddish and Tre Jones hoping the efforts, Duke was overwhelmed in the paint like it was in the first meeting. Duke played well early and had a 40-38 lead at halftime, but it didn't take long for things to turn in the second half. Duke, with its short rotation, looked worn down. North Carolina, feeding on the energy of a packed house and its blitzing offense, got stronger as the game continued. In addition to capturing a share of the ACC regular season championship, North Carolina has put together a profile that is worthy of consideration for a No. 1 seed in the NCAA Tournament. Such a distinction is by no means a lock, with ACC Tournament and SEC Tournament action sure to settle out the order between a handful of teams still battling for seeding, but when a Roy Williams-coached North Carolina team has a No. 1 seed good things tend to happen for the Tar Heels. North Carolina has been a 1-seed seven times under Williams. Every single one of those teams made it to the Elite Eight, five of those teams made it to the Final Four and three of them won the national championship. If those performances are to be expected to hold true as the average, a one seed for a Roy Williams coached North Carolina team has approximately a 42.8 percent chance to win the national championship. CBS Sports was with you the whole time with updates from Chapel Hill. Miss any of the action? Review it in the live blog below. If you are having trouble viewing the updates, please click here.